In 1985, African-American women were playing virtually no significant management roles in education or government in Northern Virginia. Since large numbers of highly educated, professionally experienced, and extremely talented black women resided there, a group of Fairfax County concerned women concluded that officials in decision-making positions were unaware of or had overlooked this pool of talent as a viable resource base. 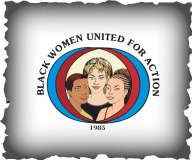 The response to this problem was to found Black Women United for Action (BWUFA) - an organization designed to increase the visibility an involvement of the African-American family. In doing so, the founders believed that they could enhance the quality of life for all. BWUFA's ethnically diverse membership has grown to include surrounding countries, cities of Washington Metropolitan area, several states around the Eastern Seaboard and Canada. Its resources and talent base have expanded as well as its community focus. BWUFA uses a grassroots education approach to its outreach with a major focus on women's issues and family preservation. Current emphasis has expanded to include various forms or assistance to "at-risk" communities and promoting a more general awareness of the lost pages of African-American history and its contributions to the building of our nation. BWUFA continually serves as a repository on the African-American family while coordinating and disseminating this information.